A meal, a pan, TWO dishes in a pan! 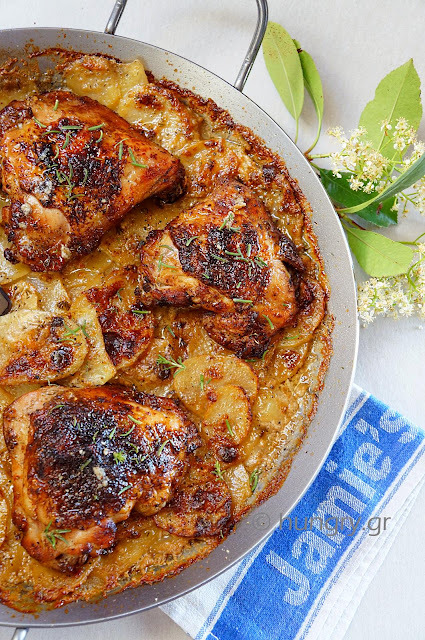 In the logic of the One Pot, all in one, prepare this special dish with chicken drumsticks onto Gratin potatoes and all together in the oven to bake. 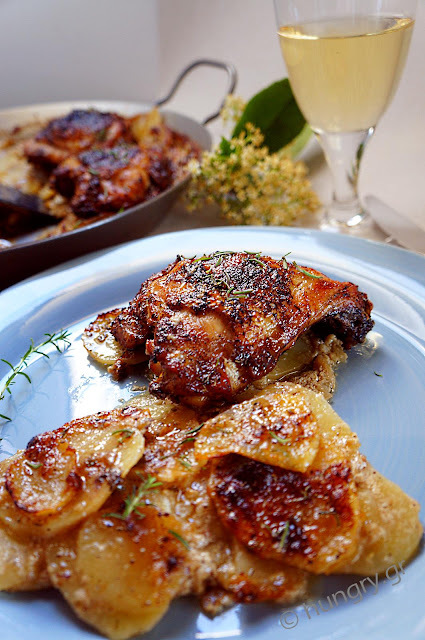 The chicken goes over the chopped potatoes and during baking all juices and tasty ingredients flowing onto gratinated potatoes, create incredible flavor. So we have a double and triple tastier dish. 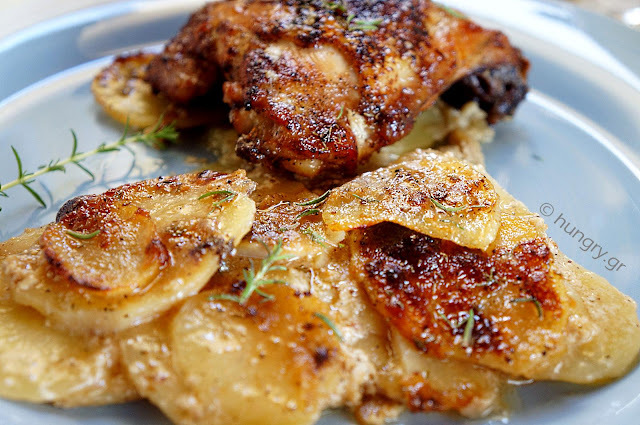 A delicious fried chicken and beautiful honeyed, juicy and creamy Gratin potatoes. 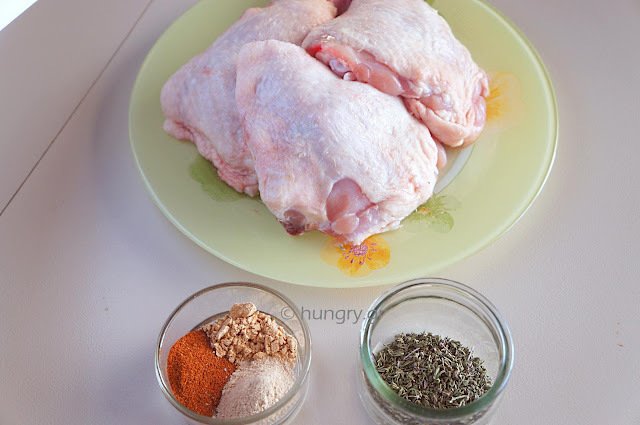 Most of the chicken fat has been removed during frying and looks like a rotisserie chicken, seasoned with aromatic spices. 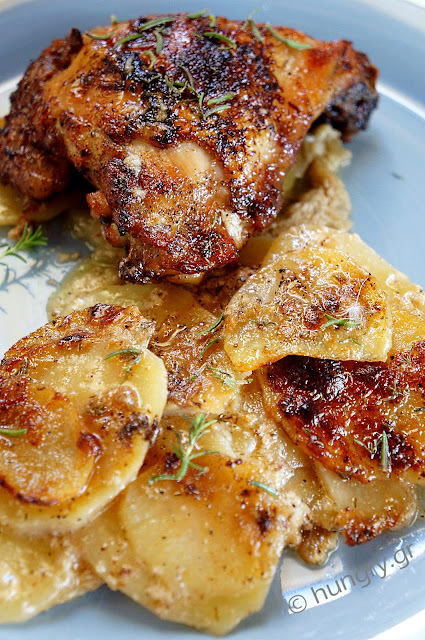 This way of cooking chicken and potato yields maximum flavor we could demand from a combination like this. Mix the spices with salt and pepper. 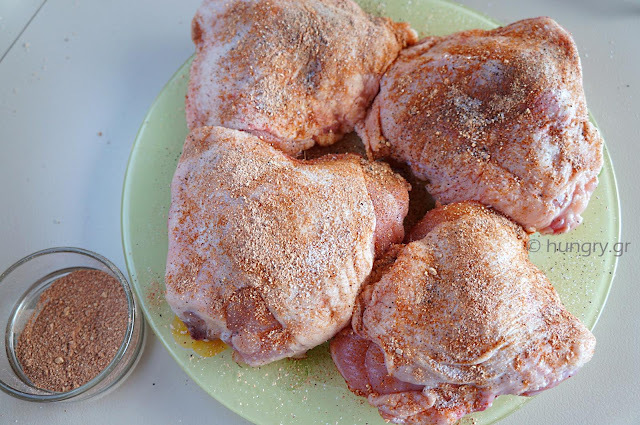 Sprinkle very well through out the sides of the thighs. 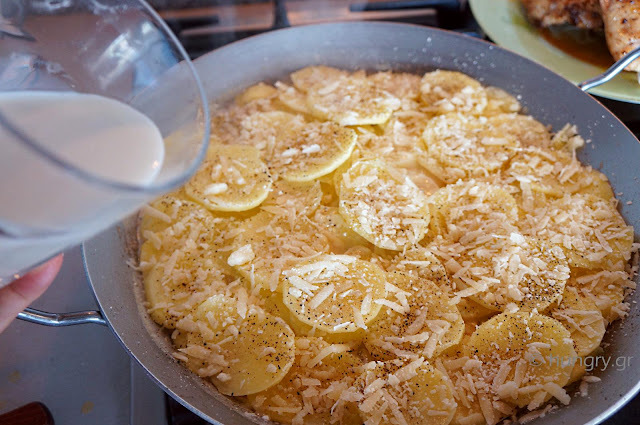 Sprinkle with dried thyme and batter. 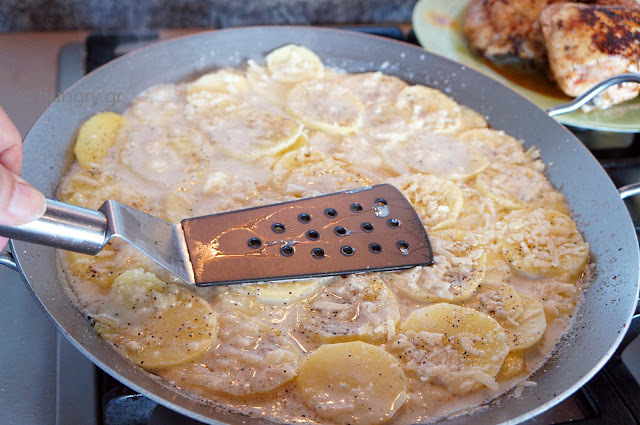 In large deep skillet, that enters the oven, and upon medium-high heat, add the oil to warm up. We touch thighs skin downward. Fry for 10' from both sides to get red color. 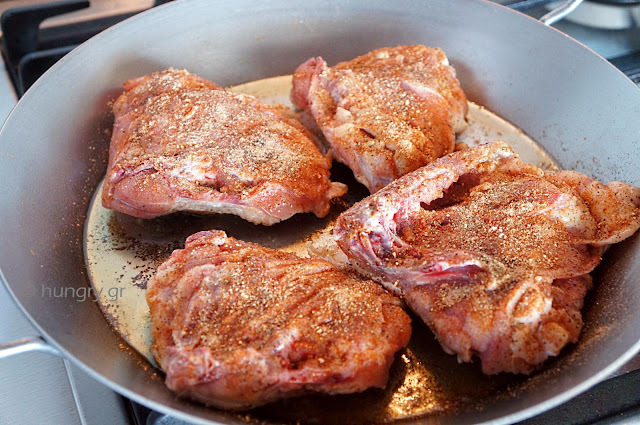 Remove the thighs and place them in a dish. Cover them to keep warm. 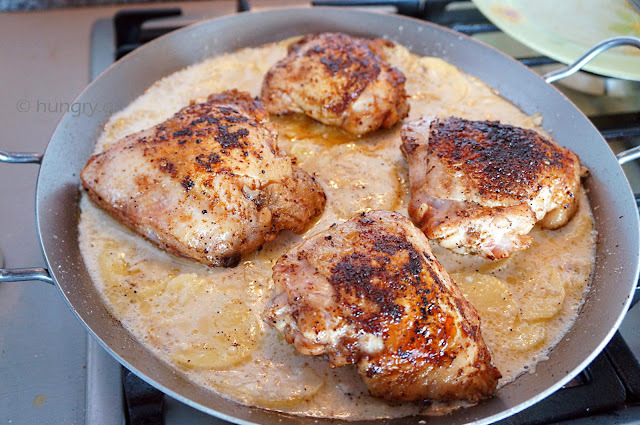 Empty the pan from the fat of chicken, do not sweep or wash. Pour the oil to warm up. Add the onion and garlic. 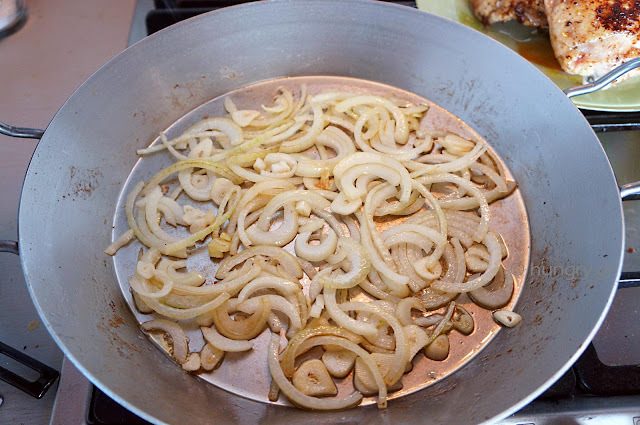 Saute for 2'-3' to polish without burn. 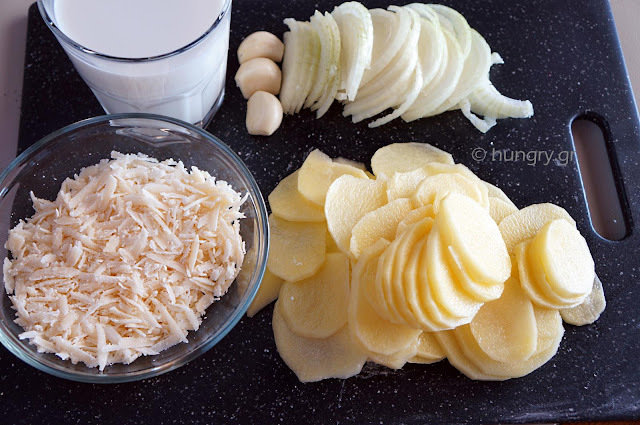 Pour half the milk and when it just begin to boil, add half the potatoes. 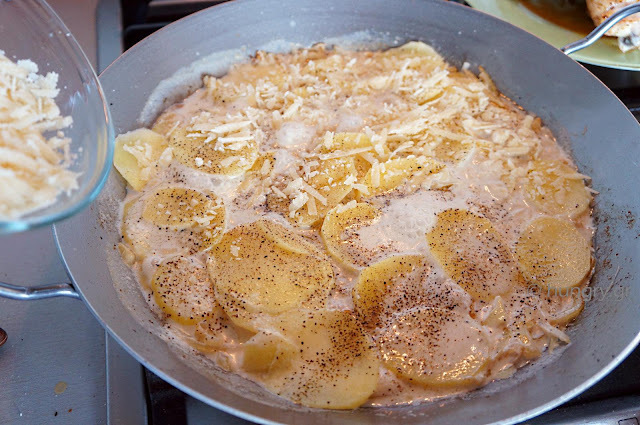 Sprinkle with salt and pepper and half of grated cheese. 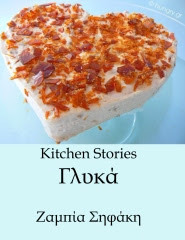 …salt and pepper and sprinkle with remaining cheese. From top pour the remaining milk. 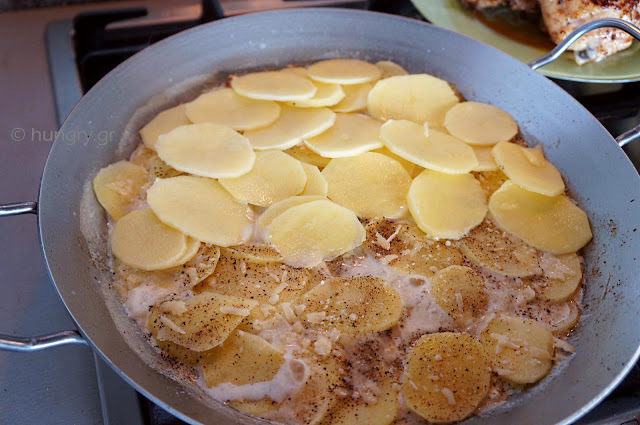 Use an egg flip to press the potatoes into the milk while it simmers for 10 minutes and some of the milk has evaporated. Place the fried chicken over the potatoes. 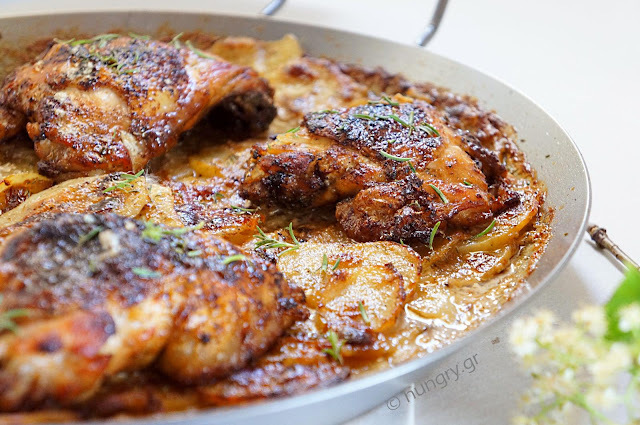 Place the pan in the oven and bake at 180°C (356°F, Gas:4.2) for 40'-50' until the chicken is cooked and the potatoes get brown at the surface. Remove the pan from the oven, leave to stand 5'-6' and serve. If there is no pan, entering directly into the oven, simply transfer all prepared ingredients from the pan into the oven dish and bake. In this case you should preheat the oven. Potatoes gratiné, with fresh or sun-dried tomatoes, juicy white mozzarella and everything sprinkled with gruyere cheese and beautifully gratiné. 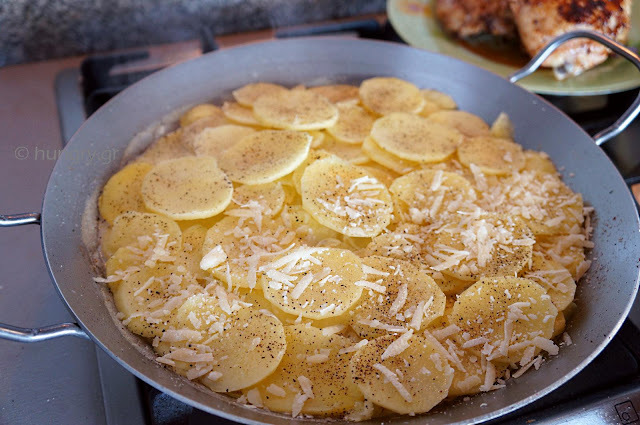 The basil adds extra flavor to the whole dish and our favorite potatoes are particularly taste. 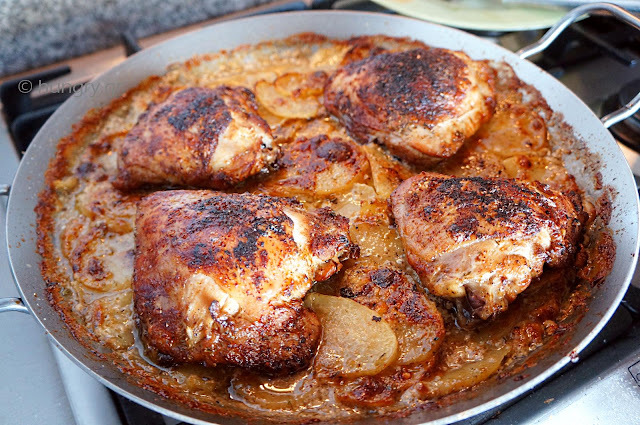 Tasty Low Carb chicken dish. Spinach, fresh vegetables and a blend of cheeses and yogurt. All together, baked in the oven for a tasty, delicius result. 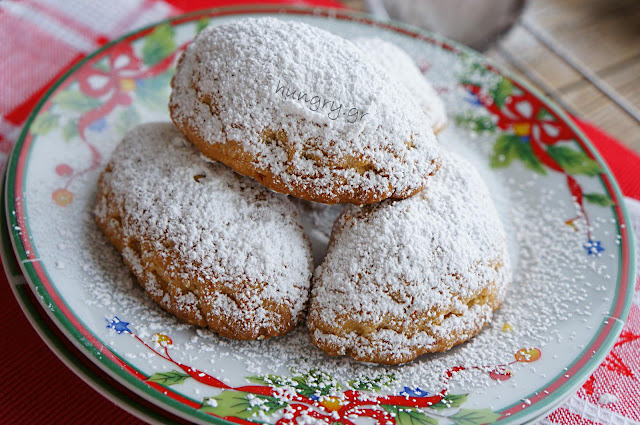 In lemon, classic, easy and delicious. 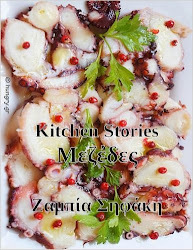 And other adjectives could describe this dish as the taste, although simple is not indiffrent. 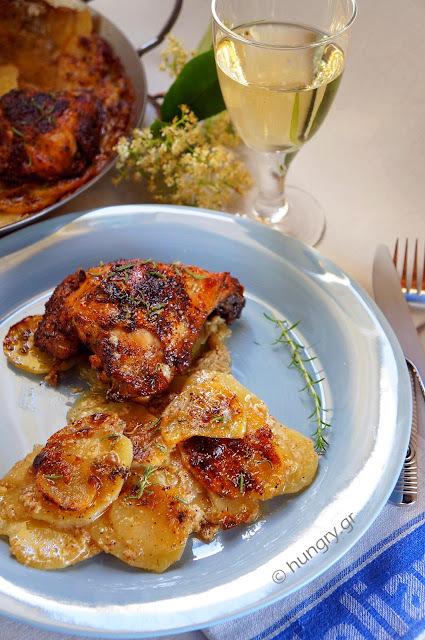 Enjoy it combined with a juicy, honeyed risotto flavored with the juices of the chicken itself.